DC Basketball was established to encourage local youth to view basketball as a door to a wider world, athletic or otherwise- and provide a network of former (and current) players to facilitate those opportunities. With that aim, and through partnerships with and the support of the National YMCA, the Smithsonian Institution, The Humanities Council of Greater Washington, and Howard University, as well as corporate alliances, we seek to increase appreciation for Greater Washington’s contribution to the game, to further knowledge of those who have contributed to this rich history, to preserve local basketball history through documentation, preservation and restoration, collection, digitization, and awards and enshrinement of deserving performers and officials. The organization DC Basketballⓒ has served in a consultant or historical research source for journalists from The Washington City Paper and The Washington Times, among others. It is also in or forming partnerships, with the YMCA, The Smithsonian Institution, Wal-Mart, The Washington Sports and Entertainment Commission, various local parks and recreation commissions, and the D.C. Public Library. Our vast knowledge and network of local basketball history and contacts affords us the unique opportunity to help your organization, its community relations staff, event planners, coaches, educators or volunteers engage youth through awareness of the great basketball players and administrators the National Capital Area has produced. To that end, our services vary from staging instructional clinics, career days with accomplished professionals who have achieved in areas these youngsters wish to follow or emulate, public presentations about this rich history, identifying local schools, parks, recreation centers and playgrounds and edifices that figured in this impressive legacy, mentoring, consultation regarding college selection and careers, motivational speaking, and joint media relations services. In conjunction with you, we can publish Internet or printed material that speaks to the DC Basketball story past and present, and illuminates your role in connecting children and parents to it. Community partnership or event hosting with DC Basketball helps establish your organization or association as an entity concerned with both local history and Metro youth. There are opportunities for your staff to volunteer, co-host, consider interns, reach new media outlets, and learn the story of our region’s significant role in basketball history. Our members and affiliates are available to assist you every step of the way. The relationship is a win-win for you and the community. Sports and scholastic history fosters pride in a way few things can. DC Basketball has planned the aforementioned events, as well as Hall of Fame banquets, charity golf outings, boat rides, celebrity basketball games, press conferences or luncheons, assisting local schools with formation of their own “DC Basketball Club”(s) and school projects, reports, web pages and exhibits- all of which present the chance for your organization to participate as a body involved in the development of our youth and the preservation of our history. Millions flock to Washington for many reasons, but precious few realize that figures as varied as Dr. Charles Drew, Maury Povich, Vice President Al Gore and broadcaster James Brown were all local basketball stars, or that a local YMCA team here formed the nucleus of the formidable Howard University team of a century ago. Some of the game’s primary referees, conference founders, coaches, and announcers are Washington area natives. No area has produced more top draft choices or NBA players per capita. The legacy lives on, and we welcome an opportunity to work with your organization to familiarize people with this story. Penny was an All-Met and All-County basketball player at Parkdale High School, where he graduated in 1974. There he was voted Player of the Week in the Metro area (for his 34 pt game vs.Northwestern H.S. ), which earned him a spot on the Sam Jones Show. As a senior, he was second in the Metro area in scoring with an Averaged 25.7 points per game, going over 30 five times, and hitting 18 of 20 free throws vs. Largo. His team won the Prince George's County championship. Greene also played on the legendary Executive III AAU team with teammates Skip Wise and Moses Malone, two of the best schoolboy players in history. Being raised in the streets of Washington DC, Greene’s early memories were playing aggressive ball with unusually talented competitors, mostly in the playgrounds and gyms around the Metro area. This is where his knowledge of the game started but also his respect for the passion so many young men had for it as well. Penny played on the college basketball team at the University of South Florida, for former Virginia ACC Coach of the Year Bill Gibson. At USF he started as a freshman, was named Most Improved Player as a sophomore, and that year broke the school single game assist mark with 15 vs. South Carolina, who featured future NBA players Mike Dunleavy and Alex English, and were coached by Hall of Famer Frank McGuire. His 142 assists as a junior broke a school record. Greene was the first USF player to score 1,000 career points, facing squads such as North Carolina (with Phil Ford & Walter Davis), Dayton (with Johnny Davis and John Paxson), Cincinnati (Pat Cummings and Gary Yoder), and Auburn (Eddie Johnson and Mike Mitchell. After graduation, Pennington went on to have corporate success with companies such as the Xerox Corporation’s Cheshire Division in Washington, D.C. from 1980-83. Greene’s honors in this early position included Salesman of the Year, Washington Branch 1981, 1982. This is where his leadership skills learned though basketball kicked in, Discipline, Dedication, and Performance. Penn also went on to work with United Airlines, Bristol Myers Squibb, Met Path Laboratories, Gershon Group and Credit link Technologies over his 30 year career. Excelling in sales management, marketing, promotions and lead generation. So now as we come full circle, a lifetime of entrepreneurship and dealing with people, DC Basketball Institute is founded with the passion that Pennington brought to his early game and now his legacy will be to create a permanent historical stamp of DC’s accomplishments. And in the process, shine a light on the incredible fortitude and character of so many of the Metro area’s players, coaches and administrators. Character is the foundation of american success and basketball helps to create confidence, pride and character. Reverend John S. Battle has committed himself to pleasing God by serving others. He not only shows his faithfulness to God’s people through the church, but is no stranger to his community. Rev. Battle holds a Bachelor’s degree in Criminal Justice from Rutgers University in New Jersey. After playing in the National Basketball Association for twelve years, he retired and became an entrepreneur. In addition to owning several restaurants in the Jock & Jill’s chain since 1987, he was also the president of a construction and renovation company based in Washington D.C. that specialized in the development of multi-family dwellings, which created modern and affordable housing in the community. Among his many roles, he was also the president of the Battle Foundation, a community service organization that provides food to the hungry in the Atlanta area. The organization has helped to feed over 60,000 people since it began in 1995. Rev. Battle is a former member of the Newnan Georgia Chamber of Commerce and currently holds membership in the Tyrone Georgia Rotary Club. As a highly sought-after motivational speaker, Rev. Battle has encouraged several groups including prisoners at the Rutgers University Rahway State Prison, The Washington D.C. School Board, and a host of churches and sports' organizations. Currently, he focuses upon uplifting in the community and enhancing the environmental and economical status of the community. Battle is married to award-winning vocalist Regina Belle. Rev. Battle's former roles as Assistant Pastor of Little Vine Baptist Church in Tyrone, Georgia and Youth Pastor at Pleasant Grove Baptist Church in Washington D.C., and currently the Associate Pastor at New Shield of Faith Christian Ministries help him to service the people and achieve his goals. A native of Washington, D.C., he played basketball at McKinley Technical H.S. (where all of his first five teammates received major college scholarships), and was an All-East performer at Rutgers. There he averaged 21 points per game in both 1983-84 and 1984-85. He scored 1,385 points for the Scarlet Knights. Battle played 10 years for the Atlanta Hawks and Cleveland Cavaliers of the NBA, averaging double digits in scoring four different seasons. He is truly carrying out a vision that he has received from the Lord. Darryl Greene, CFO of DC Basketball was born and raised in Washington and resides there still today. Darryl has worked in and around the Washington D, C, area in the Financial Fields since he graduated from Howard University in the eighty’s. Earning a Bachelor’s Degree in Business Administration with a Major in Accounting. DC is a good city with lots of opportunity for bright young men looking to get established. And this is just what Darryl did right after school, immersed himself in the world of Finance and Non Profits. Having honed his craft for over 20 years, Greene is well versed in the intricacies of Non Profit Management. Requiring an unusual amount of time on details to stay in compliance, Darryl not only understand these requirements but embraces them and then utilizes them to our organization’s continued healthy growth. Mr. Greene is not all business, as he has a love of sports also. First by being a top flight basketball player at the top high school program in America, DeMatha. This created a love for competition for him as well. The streets of DC were unforgiving for young athletes and if you wanted to play, you had to GO HARD and Darryl did. Today he is an accomplished Triathlete and accredits it to competitive basketball upbringing as one of the reasons for his persistent approach to business…It just proves the point that sports do make a difference. Darryl’s career includes positions with The Smithsonian and The Naval Institute, the District of Columbia Housing Authority as Finance Manager, VP Finance / Chief Financial Officer, Community Anti-Drug Coalitions of America, WOW CFO, Senior VP of National Alliance of Business and Senior VP of The McKenzie Group. All Maryland and DC based businesses operating under regulatory guidelines... Mr. Greene was responsible for government contracting issues; auditing; indirect costs; sponsored projects management; and administration. Now as the brother of CEO and Founder, Penn Greene. Darryl has joined the team and taken over the Leadership position in our organization’s financial areas. DC Basketball has a strong foundation not just in our Knowledge of our subject matter but also the responsible members of our Non Profit, and Darryl Greene is a valuable member of that alliance... DC Basketball will live in the next millennium with the focus and work of our members so the legends we write about today will not be forgotten tomorrow..
Bijan C. Bayne is an award-winning Washington-based freelance writer, and author of “Sky Kings: Black Pioneers of Professional Basketball“, which was named to the Suggested Reading List of the Basketball Hall of Fame in 2004. The book is also cited in “Book talks Plus: Motivating Teens to Read” by Lucy Schall. In July 2002, Bayne, who speaks Spanish, won the Robert Peterson Research Award for his presentation “The Struggle of the Latin American Ballplayer”, given at the National Baseball Hall of Fame and Museum in Cooperstown, N.Y. He currently writes for “Pro Basketball News”. Bayne's chapter on Black baseball in North Carolina appears in the book "Baseball in the Carolinas" (McFarland 2002). In addition to appearing in the upcoming documentary on the historic International League Baltimore Orioles, "The Forgotten Birds", Bayne has been interviewed on radio programs in Puerto Rico, Boston, Providence, Durham, Baltimore and Washington, D.C. A member of United States Basketball Writers Association, his essay on schoolyard basketball appears in the anthology "Basketball in America" (Haworth 2005). Bayne has been a writing instructor in after school programs and at adult education centers, as well as a public relations writer. He is currently at work researching a documentary film. Bayne has guest lectured on the social significance of the life of Jackie Robinson each year since 1996 at The George Washington University, at classes, and events such as Charter Day 1996 and Unity Week in 1999. His travel articles have appeared in AAA Horizons, Family Digest, Atlanta Goodlife, Ohio magazine, Arrington's Inn Traveler, and Hotel Executive, and his book reviews have been featured in "Washington Post Book World", "The Boston Herald", Wild River Review, and The Crisis. He is a columnist for Sports Central, and has served as a consultant for film, television and corporate clients such as The Cancun Convention and Visitors Bureau, Aviva Kempner, Jennifer Lawson, and Jay Smith, Spike Lee, Nike, and CINE. On June 10, 2006, Bayne was a panelist at the annual conference of Washington Independent Writers, on the topic of marketing as an independent writer. He is an Executive Board member, and Media Relations Director of the Association for Professional Basketball Research. His sports commentary may be heard most Monday's, Wednesday's and Friday's at 8 p.m. EST on Outsider Radio. Bijan C. Bayne's sports analysis and NFL blog have earned him a spot in High Heat Radio's "Living the Dream" competition, wherein sports bloggers will compete for a salaried national radio talk show. He is the weekly radio sports commentator for http://www.blackcoffeechannel.com/, and a frequent arts and sports history contributor to "The Bay State Banner". Bayne is a member of the Southern Documentary Fund. Born in Virginia and raised in Georgia, Krystal graduated from Jacksonville State University with a degree and English and Political Science and a Masters in Public Administration and Emergency Management. Upon the last semester of her graduate degree, Krystal began an internship with DC Basketball Institute. After searching her path, she made her internship with DCBI permanent. Throughout the time Krystal has been with DCBI she has helped ensure high growth and quality development of the DCBI organization. Focusing on the importance of helping youth to discover their potential and impact their futures, she has been a great asset to the program's development. Krystal is passionate about the organization and the values that it is committed to instilling around the nation; impacting the youth to empower the world. She loves to mentor youth, has a warm smile, and an even warmer heart. Archie Talley was an All-State basketball player at Central High School, from which he graduated in 1972. He is currently the owner of Archie Talley Presentations, Inc. No list of the greatest schoolyard, scholastic, collegiate, or summer league basketball players from D.C. is complete without Talley's name. Making a difference in young people's lives is his life's work. He holds a Master's Degree in Education from Salem (W. Va.) International University, where he earned a Bachelor's Degree as well. At Salem, Talley earned College Division All-America and Player of the Year honors in 1975-76. He was named to "Who's Who Among American Universities and Colleges for Academic Achievement" (1976). His records at the college level include, but are not limited to: scoring 50 points four different times in the same week, erupting for 60 points vs. Alderson-Broadus University, a 40.8 scoring average in 1975-76, the all-time career scoring mark of the West Virginia Interstate Athletic Conference- 3,720 points, a single-season output of 1,347 points in 1976, topped only by Pete Maravich's 1,381 (1970), and a 58-point outburst vs. West Virginia State. Talley was drafted by the NBA's New York Knicks and but played the preseason with the NBA's New Jersey Nets. He was also in the World Famous Harlem Globetrotters Camp. Later, he led professional leagues in scoring in countries such as Germany and Venezuela (his high point game in Germany being a phenomenal 116 for TV Clausen vs. Tria). Talley says his greatest accomplishments, however have been influencing and helping shape the lives of youth across America as a National Motivational Speaker. He gives presentations in Schools, Colleges and Universities, Professional Organizations, and other Events. He has appeared in Thousands of Schools and Hundreds of Thousands of young people have heard his " Ingredients Of Life " presentation which includes positive, insightful messages about Life, Respect, and Professionalism! He has done so since 1984 and in a dynamic manner that marks everything he does. "Children Are Our Future!" Click here to see them smiling and having fun while also learning important life skills with National Motivational Speaker Archie Talley. We really do make a difference in their lives! Mr. Yeldell has an extensive background in corporate finance, marketing, promotions/events management and business development with an MBA from University of Virginia and BA from Morehouse College in Atlanta. The aforementioned aside, he is a sports fanatic and a lover of basketball. He has written extensively about the sport of basketball, specifically and all sports, generally, as well as his home town of Washington, DC, in addition to other areas around the country. Having lived in and worked in several other cities, Yeldell is back in his hometown area, currently as a residence of suburban Washington, DC, in Bowie, MD. He has worked at and had, as clients, many large companies throughout the United States of America, which has given him a glimpse of the nation’s sports landscape. He has organized and promoted events throughout the country. Presently, through his company, BYG Enterprises, Mr. Yeldell continues to provide consultancy services and media advice to a wide range of corporate clients and political entities, both in the U.S. and abroad. It is from these many experiences that he draws to write a weekly essay, which he compiled for a book of essays, “Notions & Potions” . Having performed events for and consultancy services in a host of industries and over 75 cities for a corporate client for The Tom Joyner Morning Show, his experience(s) give him a unique ability to compare and contrast various cities, town, and hamlets throughout the United States, thus objectively observing, speaking on and ultimately writing about DC Basketball. As long as he can remember, Bob Kuska has been a basketball junkie. This lifelong interest in basketball history was the inspiration for Kuska's first book in 2004, Hot Potato: The Origins of Black Basketball in New York City and Washington, D.C. (1905-1930). Kuska has followed up with the soon-to-be-released Cinderell Ball, a real-life Hoosiers story about a small college in an old coal mining town in West Virginia. He's currently working on a biography of former Washington Bullet star Archie Clark. A native of Sacramento, Kuska has lived in the Washington, D. C. area for over twenty years and currently resides with his wife on eight acres in Shepherdstown, WV. JAN. 15, 2008- WASHINGTON, D.C.
Washington, D.C. has a rich and storied basketball tradition, from its top schoolboy programs to natives who were innovators and All-Americans. No other metropolitan area of similar size has contributed as much to the game. The new webpage, DCBasketball.com, honors this tradition by chronicling the great administrators, players, scholastic teams, and amateur leagues in the Washington metropolitan area. From Dr. Edwin B. Henderson, the architect of urban and YMCA basketball in the mid-Atlantic, to Elgin Baylor, who influenced subsequent aerial artists such as Connie Hawkins and Julius Erving (which in turn led to Michael Jordan), and Morgan Wootten, the only high school basketball coach in the Naismith Memorial Basketball Hall Fame, the city’s mark on the game is indelible. Noted figures such as Dr. Charles Drew, media and tennis executive Donald Dell, Vice President Al Gore, longtime Notre Dame President Edward “Monk” Malloy, and television personalities Maury Povich and James Brown played their high school basketball in D.C. So did football stars Len Ford, Jake Scott, Willie Wood, Shawne Merriman, Byron Leftwich, Cato June and Jerry Porter. It was a Washington squad, DeMatha High School, which ended the 71-game winning streak of the 1965 Power Memorial team led by Lew Alcindor (later Kareem Abdul-Jabbar). No high school has produced more professional players than DeMatha. D.C.’s Spingarn High is the only public school in American to have two players named to the NBA’s Fifty Greatest Players list in 1997 (Baylor and Dave Bing). More recently, Kevin Durant of Prince George’s County, Md. became the first freshman to win all of college basketball’s significant Player of the Year awards- the Naismith, the John Wooden and the Oscar Robertson. This season, Durant’s former AAU teammate, freshman Michael Beasley of Kansas State is averaging 25 points and 13 rebounds a game, and is projected as a Top Five NBA draft pick should he choose to leave school in 2008. The tradition lives on. 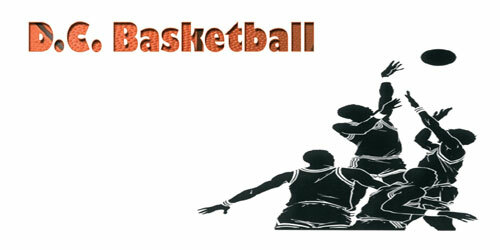 The webpage details the feats and records of such players, allows fans and former players to submit their treasured schoolyard, summer league, and scholastic basketball memories, names all-time local teams, and lists D.C. area players named PARADE high school All-American, college All-American, and other honors. DCBasketball's mission is to encourage local youth to see basketball as a door to a wider world, athletic or otherwise, and provide a network of former (and current) players to facilitate those opportunities. Coming attractions include a podcast show about D.C. area basketball, past and present, and a blog. The organization, founded by former Parkdale (Md.) High All-Met guard and University South Florida star Pennington "Penny" Greene and former McKinley Tech player, Rutgers, and Atlanta Hawk guard John Battle, will host awards banquets, career fairs, a cruise with the legends, basketball instructional clinics, and schedule regional school visits. The website serves as museum, educational tool, interactive community, and news source.